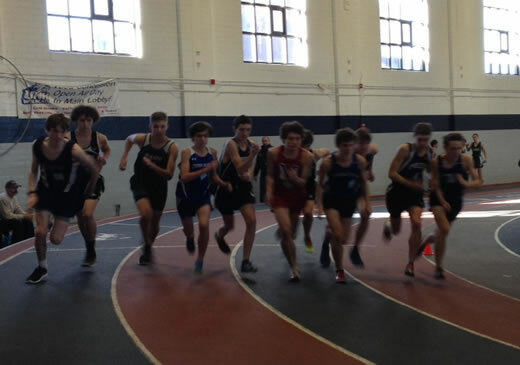 Two members of the Raymond High School Boys and Girls track team were back in action at the 47th Dartmouth Relays on Saturday, January 9th, and the full team competed the next day, January 10th, at UNH. At Dartmouth, where athletes came from throughout all of New England, as well as New York, New Jersey, and Quebec, junior Colton Corriveau posted a new best of 41.62 in the 300m. Sophomore Anna Harmon ran the 1000m in 3:08.12, placing 10th out of 91 athletes in that event. The next day at UNH, freshman Joey Hutchinson ran the 300m in 52.60, while junior Garrity Sargent ran the 600m in 1:44.20, followed by junior Cache Furmanick in 1:47.80. Sophomore Gavin Call ran a new personal best in the 1000m in 3:10.70, followed by Kristjan Fraser in his first attempt in 3:18.20. Junior Jacob Riley also ran a new personal best in the 1500m with a time of 5:00.70. A 4x400m relay team comprised of Call, Furmanick, Fraser, and Sargent ran a time of 4:25.10. On the girls' side at UNH, junior Keri Lang ran 1:01.5 in the 300m. Anna Harmon placed 2nd in her first effort in the 55m Dash with a time of 7.8 seconds and, also in her first effort, placed 3d in the 300m with a time of 44.80 seconds.